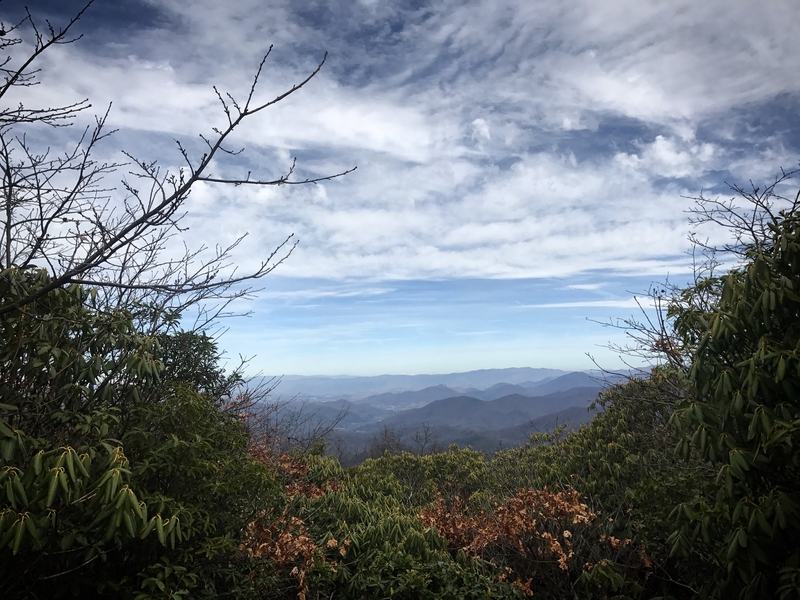 It has been five days since I left Hiawassee, Georgia, and I have since crossed two big milestones. Me (Bartender), Powerade, and Colby Jack all hitched a ride to the trailhead at Unicoi Gap. 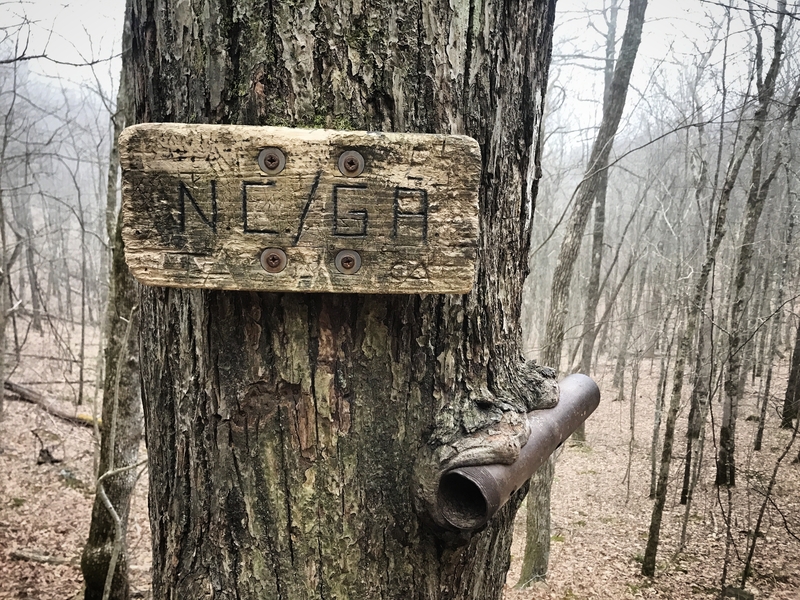 The trek out of Unicoi Gap began with a steep ascent up Rocky Mountain (over 1,000 ft over 1.3 miles), followed by another steep climb up Tray Mountain (another 1,000 ft over 2.7 miles). BUT, right before Tray Mountain, we saw a truck bed open with all tons of snacks, drinks – TRAIL MAGIC! 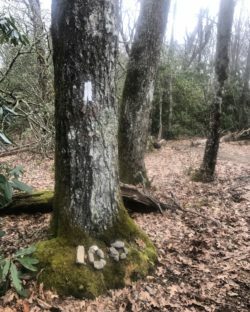 Lion Heart, a ‘trail angel’, was there, in the blistering cold, waiting for us thru-hikers to stroll by, offering hot chocolate, strawberry Yoo-Hoo’s and fresh fruit. 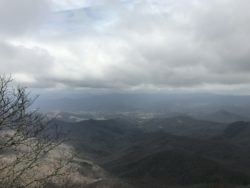 Full with hot chocolate, we climbed up Tray Mountain and got an amazing view of Georgia. It felt so good to be back out on the trail. The rest of the hike was downhill from there, eventually bringing us to Sassafrass Gap (a recurring name, we’ve found) by 2pm. 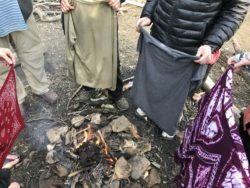 We set up camp, did our camp chores (re-organize pack, cook dinner, clean gear, journal, brush teeth), and we finished off the night with a campfire with about 10 other hikers. The night before started out nice, but the moment we went to bed, the wind began howling. 35 mph winds ALL NIGHT. 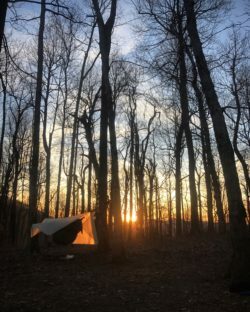 It was cold, our tents were all flapping – I didn’t sleep well that night. 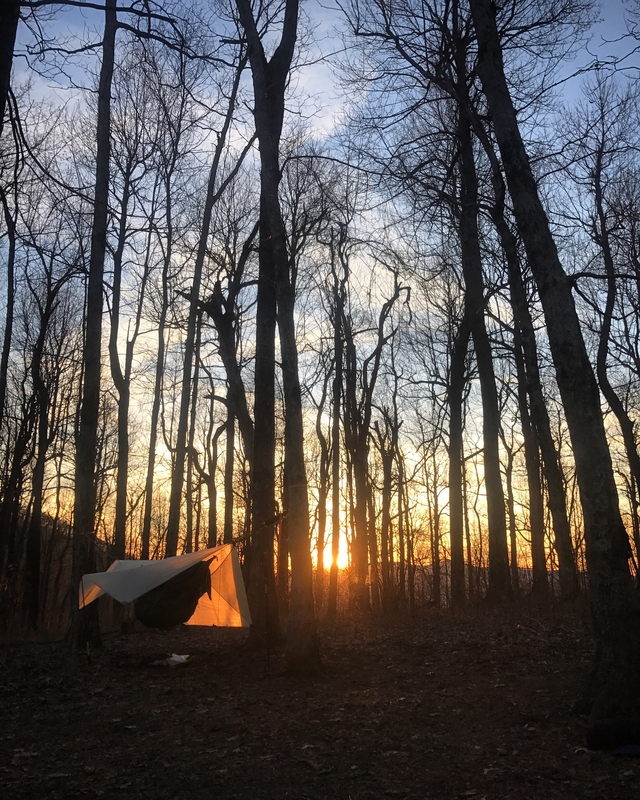 By morning, it was below freezing (again – not unusual anymore), so I brushed my teetch and packed up all of my gear and ate breakfast on the go, just to get out of the cold. And it didn’t get much easier from there. The whole day was incline after incline after incline. This day was a day for really digging in and seeing what gets me through these tough moments. I kept repeating to myself: “Just one foot in front of the other.” That has become my mantra. Climbing mountains can be draining sometimes, but when you get to the top and see that view, it all becomes worth it. We strolled into Plum Orchard Gap Shelter by around 2:30pm, set up camp, and hung around. The wind had died down, so it was much mroe pleasant. An AT Ridge Runner, Davis, was staying at the shelter (tented next to me). He thru-hiked last year, and said that he walked away with a greater sense of calm and patience. I hope I’m that lucky. We spent the rest of the night sitting around a campfire, reading and having occasional conversation. It’s similar to putting hot water in a bottle, but without the possibility of water leaking in your sleeping bag. I had the best sleep so far that night. Big milestone day! We left Plum Orchard Gap Shelter, aiming for Standing Indian Shelter. It was a steady incline, nothing too intense. 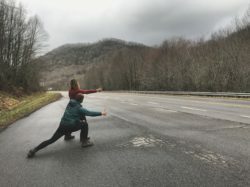 About 4.5 miles into the day, we finally crossed the border between Georgia and North Carolina! 1 state down, 13 more to go! We took a break there, at the border, drinking water and celebrating such a big milestone. 5 minutes into standing in North Carolina, it began to rain. We put on our rain shells and began our hike through state #2. Almost immediately, we were met with an intense ascent up Couthouse Bald, having to climb 900 ft in just a mile. It was rocky, wet, muddy, and STEEP. It also never seemed to end. My feet were hurting as we got closer to Standing Indian Shelter. 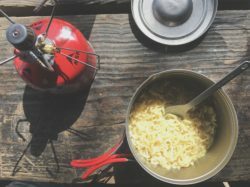 Once we got there, I took 3 ibuprofens and made myself some ramen dinner – well deserved, I think. 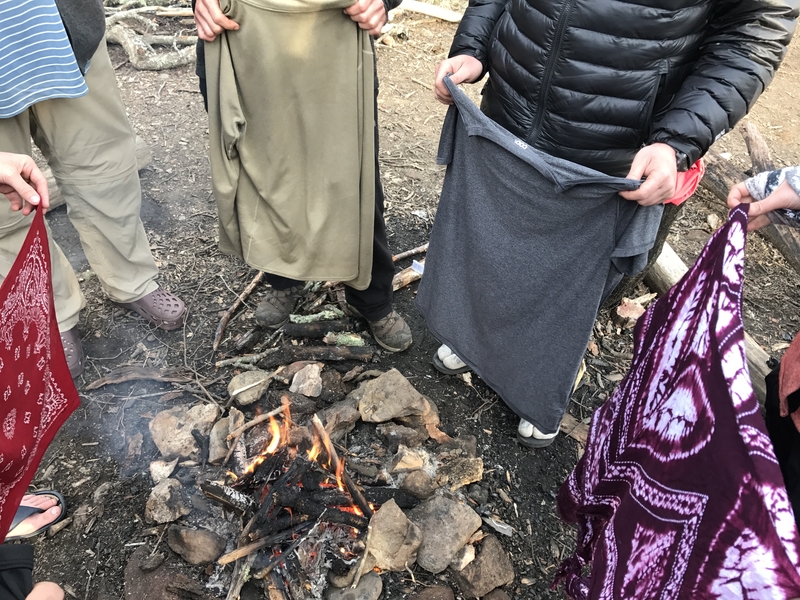 We all hung up our bear bags (nightly entertainment, really), built a campfire, and dried some of our clothes. The day was physically challenging, but it was most certainly worth it. A big miler today and another big milestone! We woke up early and began hiking at around 8am. The goal for the day was only to get to Betty Creek Camp – an easy 11.3 mile day. I ended up getting to the camp, however, by 12:30pm. I sat for an hour, making and eating lunch (peanut butter, salami, cheese, wrapped in a tortilla – don’t knock it until you try it), waiting for Powerade and Colby Jack, who started out a bit later than I did. They showed up and we all thought the same thing: Let’s just push to Long Branch Shelter – another 5.0 miles. 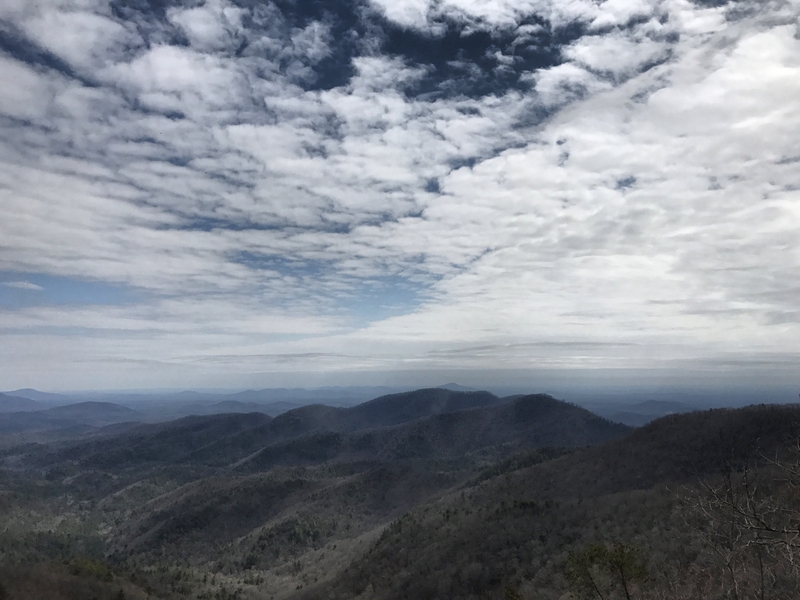 We all wanted to make sure that when we summited Albert Mountain (the 100-mile mark), we wanted to get a good view. And with the storm slated to come through the next morning, we thought we might not get a good view then. So, it was basically now or never! Albert Mountain is a beast. At times, it is so rocky and steep that you have to put your trekking poles away and just rely on your hands to help scramble up the mountain. We had to climb about 400 ft in three-tenths of a mile. But the view…. oh my goodness, the view. A beautiful reminder of why we’re all doing this. 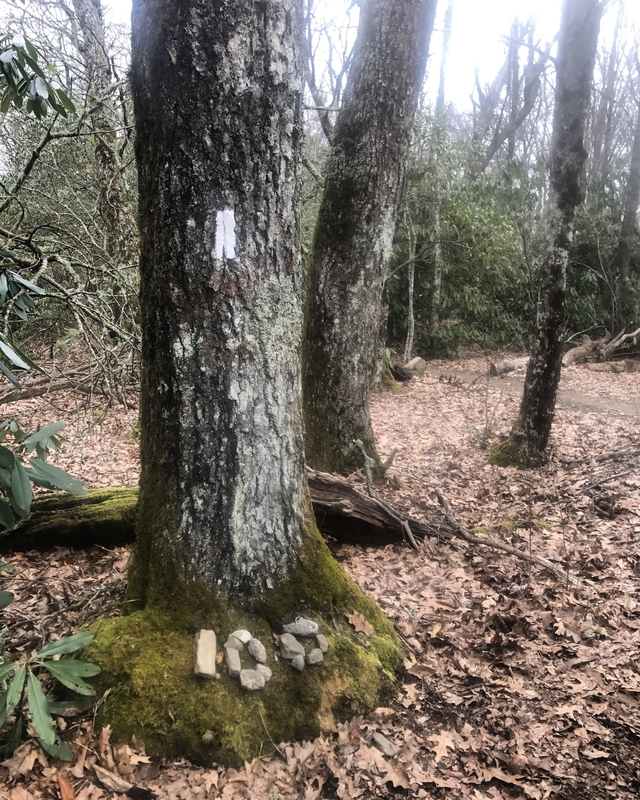 We have now hiked 100 miles of the Appalachian Trail! The hike down to the next shelter, Long Branch Shelter, was a cake walk compared to all that we’ve done before. We set up in the shelter, to avoid the incoming storm. It rained all night, but by the time we woke up at 7am, it had stopped. I packed my stuff up and headed out. 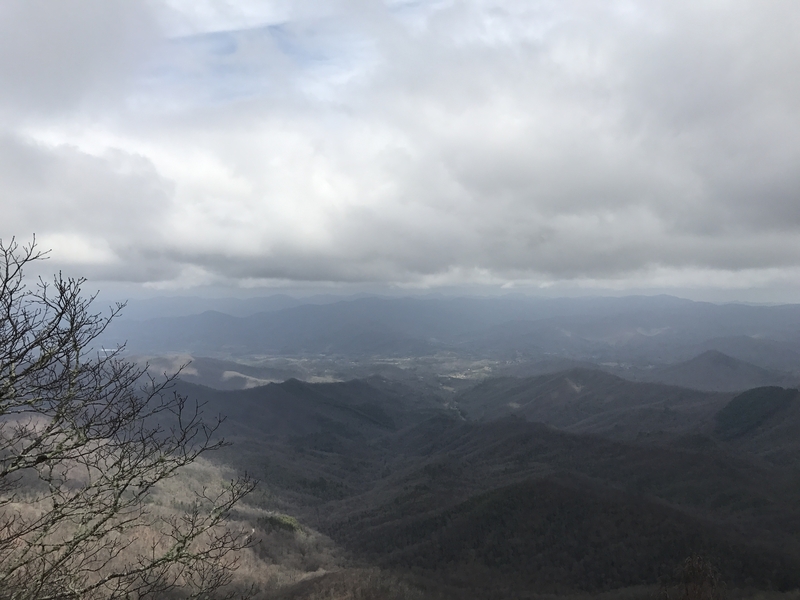 The goal was to get to Winding Stair Gap so I could get a ride into Franklin, NC for my next zero day. It was a breezy 7-mile hike on a well-maintained trail. Once we got down to the gap, I brought out my hitch-hiking bandana (“Hiker to Town”) and got the three of us a ride almost instantly from some past thru-hikers. 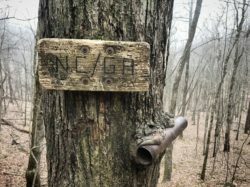 I continue to be amazed at how wonderful people are here along the Appalachain Trail. The community really looks after its own. Franklin is special. By far, my favorite town so far. Everyone seems to pitch in and help us thru-hikers get around town, offering shuttles, sometimes in their own cars and on their own time! There are breweries, restaurants, bars, a movie theater. And the people! They’re amazing. We’ve heard some of the best stories I’ve ever heard from the people who have generously helped us here. 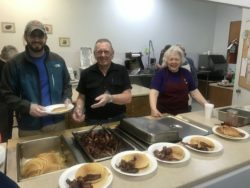 This morning, we got shuttled to the First Baptist Church who was hosting all passing thru-hikers for an all-you-can-eat pancake and bacon breakfast. I’m overwhelmed with everyone’s generosity. It’s the type of generosity that changes you. It makes you want to give more, pay it forward. I have now been here for a day and a half, and I could easily spend even more time here. 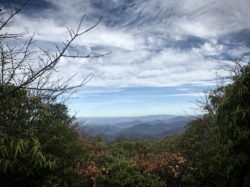 So, tomorrow I head back out there with my eye on the Smokies. Wow! State #2!!! Way to go, Stephanie! Prayers for you continue, brave heart. Or maybe you are really brave sole. Prayers for your feet too. We are LOVING these posts. Thanks for the great images and for taking the time to drag us along this way. Keep Pushing Through, Fantastic Blog, Amazing Hike ! EXCELLENT job!! Keep on trucking!!?? ?